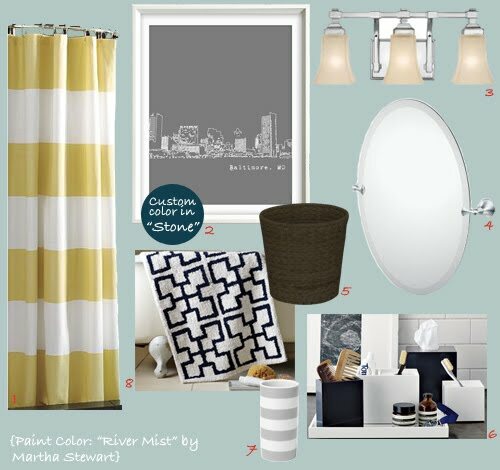 Here is the new and improved design board for my brothers' bathroom at my parents' house! What do you guys think? Forgot what the original design board looked like? Check it out here so you can compare. Here is a rundown of what we switched out. We changed out the bathroom light fixture since the previous one was a tad too modern. And honestly it looked nothing like the photo provided online once we got it delivered. It was so disappointing because it wasn't what we were expecting. Lesson learned - if you're on a time crunch, always order in advanced so that you've got time to find something else if the original item doesn't work out. In our case, there was no rush but a good lesson learned. This time around, I actually went to Home Depot and found this Hampton Bay one that I thought would be perfect. The mirror also got switched out to something more classic. My mom was not a fan of the Ikea round mirror that I thought would work out. She really wanted something that had a more prominent frame around it, but I could not find one that I thought would work, so in the end we compromised and decided on this Moen one - frameless yet classic. It's funny, I'm actually glad my mom protested because I prefer this Moen one much more than the Ikea one now. What I had chosen for artwork seemed like a good idea at first, but then I realized that it might be a tad too girly for my brothers. SO, I found another print that I thought was more appropriate for them. This print of Baltimore City's skyline seems to be perfect since the city is only 20 minutes away from the house and it's where Tim (the older of the two brothers) went to grad school. But instead of the gray, I would choose the "Stone" color that is offered. And last but not least, I switched out the wastebasket for something a bit softer since there are a lot of straight & geometric lines going on in this bathroom. Plus, this new one adds texture that the other one didn't have. *For some reason, I couldn't find the exact one I purchased from the stores online. But if you really wanted it in the darker shade, you could always spray paint the lighter one in a darker shade. One of these days we'll have a final install day, which I promise will be soon since I dying to get this bathroom done ASAP. But until then, let me know what you think of this updated design board!